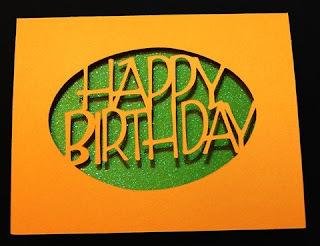 I had a request from a reader for a ready made file with "Happy Birthday" in the opening - she had not been able to work with the software much due to health issues - so I put these two files together quickly. 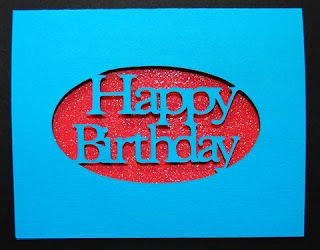 Since everyone can use birthday cards I thought I would post the files here for anyone else who might want them. The first is Plantin Schoolbook only - here is a closer view. Be sure to keep track of the dot for the "i" - you can attach it to the "b" with a dot of glue (if you lose it you could always use a dot of marker or glitter). The second is done with George only - I think the glitter card stock looks nice as a background for these, if you have a mat stack you can cut one mat in half and it will fit the behind the opening very neatly.